Grayling, Michigan was a major player in the logging industry until around 1920. This once thriving metropolis, built on sawdust and woodchips now had only the railroad and a budding trout industry. There were just enough jobs and light industry to support a small local population for those who chose to stay. Among those families who stayed were Liland and Jessie Smock who, in the grips of the great depression raised their family of five children. During those years, Liland found work at a local lumber mill and at a hardwood flooring company and eventually opened his own, 'Smock & Son's Watch Repair'. Among the Smock children was Robert Charles (Bob), born November 23, 1926. Bob's early years were quite typical of a child growing up in the area; school, chores and playing with his friends, but with one significant difference. As a young teenager Bob was down "dunk'n a worm on the East Branch of the Au Sable River," where he saw Stan Madsen land a big trout with a fly. Stan saw that Bob was impressed. He broke off the fly and gave it to Bob and told him to "go home and tie some of those." That's when Bob first got the 'bug' for fly fishing. Like most young boys Bob's major interest in high school was sports. He was a halfback on his high school football team and according to his older brother Don, "Bob was an all-around high school athlete, and one hellava football player." Along with school work and football, Bob worked at a local market learning the trade of a meat cutter and butcher. Later in life these skills would become of value to him. In 1941 the United States went war with Japan. Many young men eagerly wanted to serve their country. Bob was no different. In 1944, shortly after his eighteenth birthday, Bob dropped out of high school and enlisted in the U.S. Navy as a able-bodied seaman. He first saw duty in Australia but finished up the war stationed on Leyte Island in the Philippines. During his time in the Philippines he contracted malaria which occasionally would flare up throughout much of his younger life. When the war with Japan ended Bob re-enlisted for an additional two years. The navy sent Bob to yeoman school. 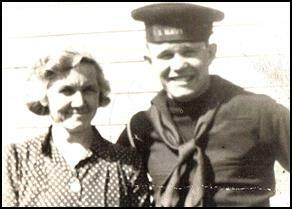 As a newly promoted petty officer he was assigned to the USS Renville, an attack transport. In 1946 it sailed to Japan where it picked up Allied prisoners of war for transport to Manila. Having seen enough of the world, Bob was discharged in November of 1947 and returned to his home in Grayling, Michigan. He found work at 'Hanson's Sporting Goods' in town where his interest in hunting and fishing began to grow. His employment at Hanson's was short lived … a new company had just moved to town by the name of Bear Archery. The factory was located on M-72, immediately west of town. Bob was hired in and started work in the bow department. With a good job and few bucks in his pocket he met and fell in love with Barbara Schmidt. They eloped in January of 1948, just two months after his discharge from the navy. In 1947 when Bear Archery moved from Detroit to Grayling, it was the only major industry in the town. Most everyone in the area worked there at one time or another. The work was good and the wages honest for the time. Bob started out in the bow department but within a short period of time he was promoted to a foreman. One day while working, "he was asked to sign for a shipment of wood. He refused the shipment stating that it wasn't up to standards. Fred Bear inquired as to who refused the order. Bob Smock fess'd up. Fred Bear was so impressed that Bob turned down the shipment of bad wood that he promoted Bob to the purchasing department, where Bob worked until his retirement." Working for Fred Bear provided Bob with a lot of opportunities that he would not have otherwise had. 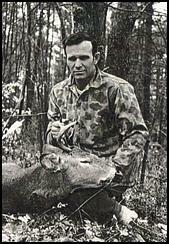 On several occasions Bob was sent on hunting and fishing trips to Main, Minnesota and British Columbia with valued customers and celebrities when Fred could not personally attend. Bob also had the opportunity to represent Bear Archery at several bow fishing tournaments. On one occasion he met and fished with Arthur Godfrey, the famous entertainer and television host. On still another occasion, James Drury, star of the western TV series, "The Virginian." As Bob and Barbara began raising their family, he started to take a serious interest in hunting and fishing, spending many hours in the woods and on the waters. He grew to know many of the famous local fishermen, guides and tyers of the time; men such as Bill Huddleston (Sailor Bill), Chuck Crow, Jack Mason, Clarence Roberts, Jerry McClain and others. In 1956, Bob approached Clarence Roberts, the local game warden and skilled fly tyer and asked Clarence to tutor him in the art of fly tying. Bob would spend many a night at Clarence's learning the craft. They went on to become great personal friends over the years. By the 1960's, Bob Smock was raising his children, girls included, to be hunters and fishermen. Even with his good paying job at Bear Archery, he had seven children to feed. Times were tight, hunting and fishing was a mainstay for the family. All of his kids had 'deer tags.' If they didn't fill them, he would. His freezer was always full of venison … the occasional out-of-season deer always helped. The family vehicles became tools for the Smock family's notorious road hunting trips. Partridge, deer and rabbits, all became fare game. It's said that Bob's wife Barbara became an expert at disguising venison at the supper table. Bob's experience as a butcher allowed him to process all his own meats. He also processed all his own skins and hides for fly tying. He never passed up a road kill … local hides, furs, feathers and tails were all valuable to him. While Bob worked at Bear Archery, Barbara ran a day care center, often times having as many as twenty kids at the house, all from the families at the Bear Archery plant. She also took in laundry from the army soldiers stationed at Camp Grayling … every little bit helped. One of their daughters, Jeanie, states: "We had fairytale parents. They were always there for us. We never wanted for anything." Bob and Barb were active in every aspect of their kid's lives. Barb at one point was a Cub Scout den leader, while Bob did the camping with the scouts. While his kids were in the school system Bob served on the school board for seventeen years, both as a trustee and secretary. He was also an active member of the American Legion Post in town. In 1978, a strike at Bear Archery resulted in the plant closing. The operation was moved to Florida. It was devastating not only to Bob Smock but to the entire community. Bob, along with a few other loyal employees, was offered the opportunity to move to Florida with the company. But having spent most of his adult life in Grayling and with a young child still at home Bob decided to remain behind. So now, with 31 years at Bear Archery, at the age of 53 he found himself unemployed. As luck would have it, Bob had started tying commercially around 1975. He had already built up a small customer base selling his flies in shops and sporting good stores in Grayling, Mio, Roscommon, Luzerne and Kalkaska. In 1981 the opportunity came along to purchase the sporting goods store in downtown Grayling that was once called Hanson's Sporting Goods, where he was first employed after leaving the navy. He opened his new store which he renamed, "Old Au Sable Sporting Goods." Featured in the center of the small shop was a large round table were local personalities would gather to share coffee and spin yarns. Located in town was one of the nation's biggest discounters. This competition placed a financial strain on Bob's business and was a major contributing factor to Bob closing the shop in 1986. Even though the shop was closed, Bob had an established clientele. He was now a very well known commercial tyer, tying 600 dozen flies a year. It was during his tenure at the store when he most likely authored the two fly patterns for which he is best known; the Deer Fly and his Sulfur Dun. These patterns still have a following today and are in use on the Au Sable and Manistee Rivers. 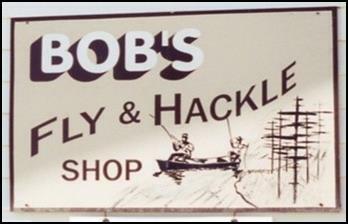 In 1987 Bob opened his small shop in the garage of his house, "Bob's Fly Hackle Shop." The shop was located at 909 Michigan Avenue. He continued to tie commercially for his many clients and provide flies and tying supplies to his walk-in customers. His guest book provides proof that he had clients and visitors from all fifty states. At the little fly shop in his garage the "coffee pot was always on and he always welcomed the opportunity to spin a yarn or two with anyone who would listen." Bob was truly a master fly tyer. He was from the old school. He would only tie with natural materials, using only commonly accepted synthetics like floss, chenille and wool yarns. Everything else was natural hair, furs and feathers. He processed and dyed all of his own materials. For most of his tying years he used only a small homemade bobbin. It was nothing more then a piece of twisted wire that was so small, it was actually concealed in the palm of his hand. He never used hackle pliers accept when tying extremely small flies. He never used a hair stacker or a whip finisher. Being a commercial tyer he rarely tied smaller than a size #18 except for himself or for special orders. 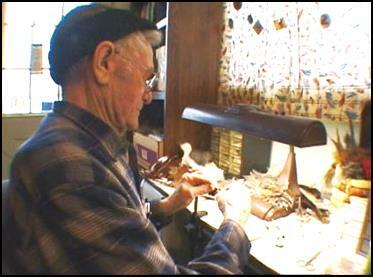 His tying career extended for more than fifty years. His legacy is not with the two famous patterns that he developed but rather with his ability to tie and recreate with perfection, the flies of the old Grayling masters who came before him. Now, with his family raised, he still found time to serve his community. He often would tie flies at events in the Grayling area, the school, the library, the Lovell's museum and at the local fly shops. He also kept busy working for the Commission on Aging delivering Meals on Wheels until his health would no longer allow it. During his many years as a fly tyer both in the store downtown and later in his garage, Bob passed on his craft to dozens of young fly tying students during the summers and on weekends. "Sure, he'd happily tuck a few of his hand-crafted gems into the palms of youngsters eager to hit the river, but more often than not, he'd get them to sit still at his bench long enough to learn the basic skills of his craft." Bob found time to mentor these young students, not only in the art of fly tying, but also mentoring them as a parent would his child. He became a role model to them. With each of them he developed a "very special relationship". Many of his students are still tying today. They all speak very highly of Bob. Bob's two original fly patterns that he created back in the 1980s hopefully will endure for many generations to come. They have been tied and sold in the local shops since he first conceived them. This fly was originated by Bob to imitate the deer fly. He most probably developed it during the time he owned the "Old Au Sable Sporting Goods" store on Michigan Avenue. The fly in this photo was tied by Bob Smock. 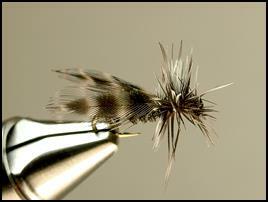 Bob authored this fly to be used for the sulfur dun hatch. This fly was developed during the same time frame. 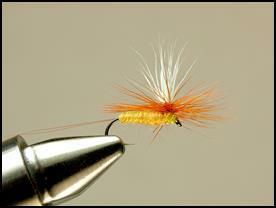 This fly is also called the Tangerine Sulfur Dun or the Tangerine Dream. The fly in this photo was tied by Bob Smock. Over his many years of tying Bob was highlighted in many newspaper articles. 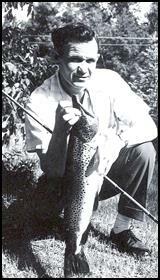 He contributed to the guide book, "Trout Streams of Michigan" and was featured in a video production entitled, "A Century of Fly Fishing History." As Bob aged his health waned. But early, each morning he still tied a couple dozen flies, while drinking his first cup of coffee. On March 24, 2005, Bob Smock Sr. passed away, leaving a legacy of seven children, twenty-one grand-children and sixteen great-grandchildren. His little shop in the garage, at 909 Michigan Avenue, was kept intact for a little over a year, so that friends and customers might stop by and pay their last respects to one of Michigan's most celebrated and legendary tyers. A few months after Bob's death, his ashes were scattered on the Au Sable River. With Bob's passing, "the trout in the Au Sable can rest a little easier." To Bob, from his family and friends … you'll not be forgotten. Tom is a retired biology teacher from Michigan. He's been on the water and at the bench for almost 30 years. He's an amateur historian and sports writer, specializing in articles about old Michigan dry flies and old Michigan tiers. He maintains a website, www.michigandryflies.net, where he can be reached. A special note of thanks is due to Bob's family and friends as well as to the many tyers, river guides and former students of Bob. Without their knowledge and input this article could never have been written. A special thanks to Jerry Kunnath who allowed me to use his photograph of Bob at the tying bench.